He’s finally lost it. It’s far too late in the year to make the Christmas cake. That’s what you’re thinking. But it’s never too late. There’s always a way. My Simple Christmas Cake recipe proves that; it’s one of the most enjoyable I’ve had and can be made only days before the year’s main event. No. I challenge you to make it only days before. Traditional Christmas cake can be such a bore. Even if you do have a recipe that yields a genuinely enjoyable article, it’s likely required extensive preparation, perspiration and at least a modicum of perseverance. Ok, so they’re not all that troubling, but they do elicit a certain pain in the posterior. 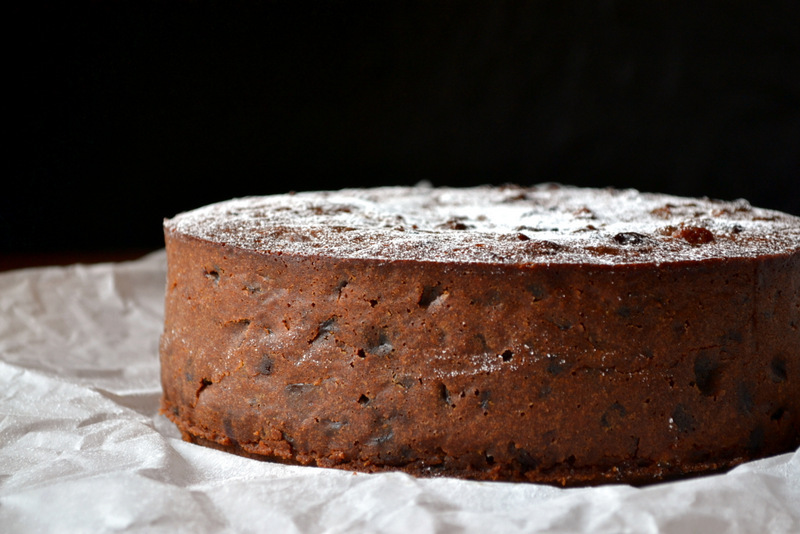 Instead, opt for an easy Christmas cake. If you have time you can still feed it and nurture it. But if there’s no time, you don’t have to. 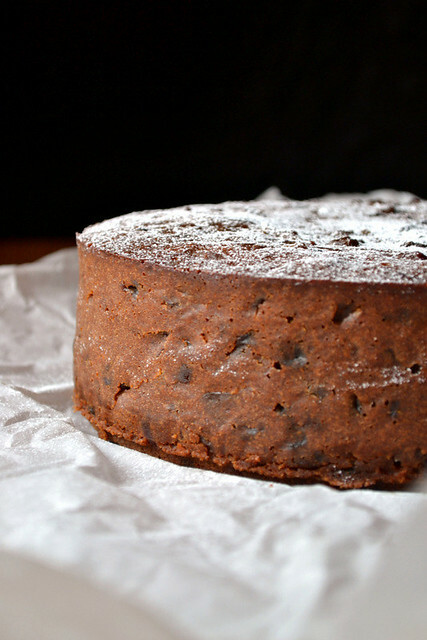 The best thing about a simple Christmas cake is that its method naturally produces a perfectly moist fruit cake. Essentially an all-in-one cake, this recipe naturally turns out a moister cake than the traditional creaming approach. Add to that delightfully hefty additions of cream sherry – my preferred Christmas cake tipple – and freshly squeezed orange juice and you can see where things are going. Easy, rich and moist. You may also have noticed my cake’s distinct lack of marzipan and icing. It always seems a shame to cover the impressively deep flavour of a festive fruit cake with super-saccharine shenanigans. Don’t bow to the weight of familial expectation. 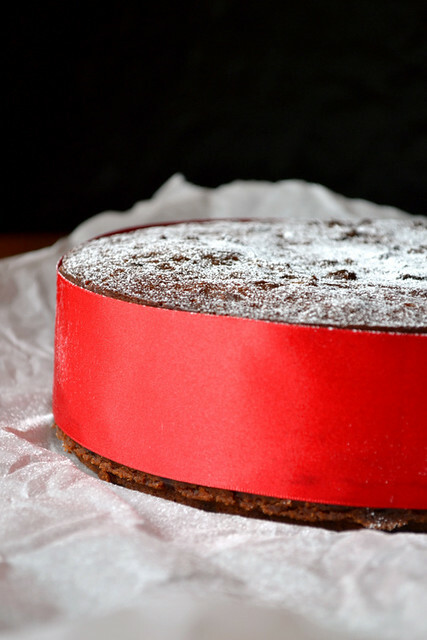 Stand firm in the knowledge that your Christmas cake – however easy it was to make – will hold its own. Grease and line a round 23cm springform baking tin. Tie a separate double layer of baking parchment around the outside of the tin for insulation. Preheat the oven to 170C/150C(fan). Tip the dried fruit, orange juice and zest, and cream sherry into your largest saucepan. Heat over a low heat before adding the butter in chunks, sugar and dark treacle. Once the butter has melted, stir in the ground almonds. Remove from the heat and set aside for 2 minutes. Incorporate the eggs into the cake mixture one by one. Fold through the plain flour, baking powder and mixed spice. Transfer the prepared batter to the lined baking tin and bake for 2 hours until browned, slightly cracked and ever so slightly sticky in the middle. Allow the cake to cool fully on a wire rack before turning out. Wrap up in baking parchment and foil until Christmas or decoration. It should keep well for 2-3 months. 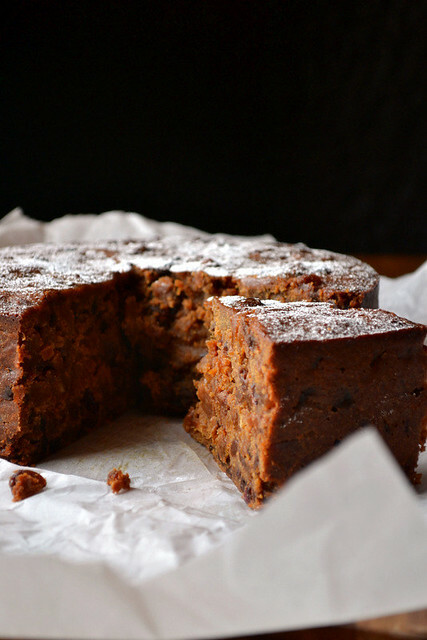 Cost: Christmas cake isn’t the cheapest cake going and the cost of yours will largely depend on the sherry and dried fruit you use. I’d suggest that better quality fruit is a better investment than expensive sherry. Besides, even cheap cream sherry is relatively palatable. All in all, following this recipe you should quite easily be able to produce a simple Christmas cake for as little as £7. Not bad, considering its size; no need for a turkey dinner. I don’t have any cream sherry, but I’ve got 2 bottles of dry sherry sitting in my cupboard. It would be a shame to have to buy yet another bottle. Do you think this cake could work with the dry sherry? Should I add more sugar then? Really sorry for my late response. Just go with the dry sherry. No need for extra sugar either! I hope you enjoy the cake. So much tastier without the marzipan and icing. Looks lovely! Exactly – I like to appreciate my fruitcake. Boiled Fruitcake. I would never consider making any other sort. It’s what I grew up with and I’ve never understood why you would make the other sort when boiled is so much nicer every time. I agree that sans marzipan is best too. Yoiu know, this is very similar to a boiled fruitcake. It’s certainly as nice as any boiled cake I’ve ever eaten! I was thinking of bringing a stollen to each of my children’s households, but maybe I’ll do this instead! Could you tell us how you would “feed” this cake? I’m in the U.S. and ignorant of this concept. Sorry for the late response – feeding the cake simply involves adding a tablespoon or so of sherry, brandy, rum – whatever alcohol you choose – to the cake every few days. It then matures and gradually improved the flavour. This is absolutely gorgeous Nick! I love a delicious Christmas cake. I’m going to have to make this one. Happy Christmas! Please do, Karista – I enjoyed it so much. Looks lovely and squidgy. I wish I loved Christmas cake, I should try making it myself sometime really shouldn’t I.. Yes, it was certainly squidgy. Just like its creator. You should. Super simple. Epic cake Nick. Perfect festive cycling fuel. Thanks, Conor. You’re right and I’ve needed it. That looks DIVINE, my mouth is watering…. Thank you – I’m going to have to make another! I always make my cake about now, so its not too late! Going to try your recipe now! Brilliant – I hope you like it. Ours has all gone and I need to make another. Oh you totally can! And you can still feed it a bit too. It’s not too late at all for Christmas Cake making, there is still plenty of time to feed it with booze!! That’s true, but some do prefer to make it many weeks in advance. Nick this is a work of art. Not only does the cake look good it has been photographed so well. This is a keeper of a recipe. Thank you so much. I am one of those people who like a thin layer or Marzipan but you have convinced me to go without. Now just have to figure out where to get black treacle. Thank you! I don’t mind marzipan, but I’d rather without. Each to his or her own though. I’m afraid I can’t help with the black treacle. I think everyone should take you up on this challenge, Nick. Your cake sounds wonderful. They should indeed! Thank you, Karen. This looks so good! I am going to be making this to take to family over the holidays. Fantastic idea; I’ll be doing the same :). Nick, I love your Simple Christmas Cake! I so much prefer a fruitcake without any icing. Not a fan of marzipan or any type of “super-saccharine shenanigans”! I do have extra homemade mincemeat on hand (posted my recipe today) so will check out your mince pie cake. Thanks! The mince pie cake is really delicious. I’m looking forward to having some left over myself. That’s a shame, It’s very popular here. Both types of sherry are fine (sorry for my slow response). The parchment is literally just a length of parchment folded in half and tied around the outside of the tin. Let me know if you need further description! I made the cake but used dark rum instead of sherry, it has turned out very well and made loads of cake! I will make it again but half the ingredients next time. It keeps very well though, and is better now than when I made it (when the recipe was first published). It is a rather large cake, but I’m glad you enjoyed it! Surely your recipe is a boiled fruitcake? 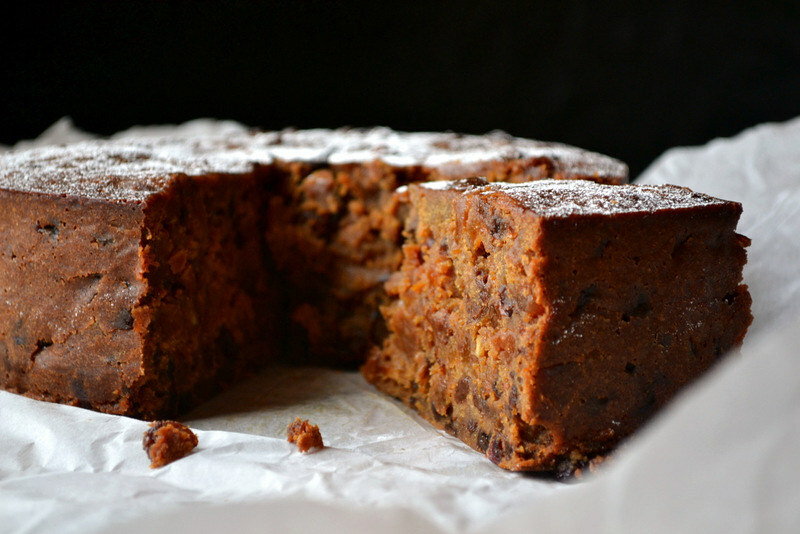 How does it differ from your idea of a boiled fruitcake? Hi, I made this cake this Christmas, as unusually I was running very late and completely missed stir up Sunday. Over the years I’ve made a host of celebrity chef recipes,normally at great expense, one year I needed a whole bottle of brandy! But this recipe was by far and away the best. Very moist and soft but not stodgy, just lovely. This is definitely a keeper and I’ll be making it next year too. Thanks for the recipe. Brilliant! Thank you so much. I can’t wait to have an excuse to make it again. I really love your blog , keep it up !